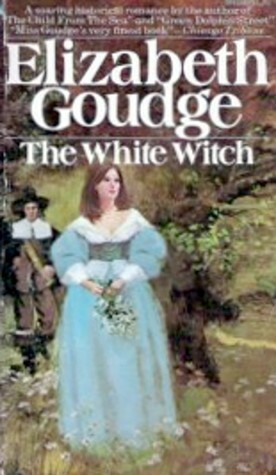 Elizabeth Goudge is one of my favorite authors, and I always think I’ve read a lot of her books. In fact, when I look at her bibliography, I find I’ve read only a small fraction of them, either her children’s books or her novels for adults, and I’ve read none of her nonfiction at all. I think my impression comes from reading the same novels over and over again: the Eliots of Damerosehay trilogy, The Dean’s Watch, and a couple of her children’s books. In the past few years, I’ve tried to expand my horizons a little and see what Goudge is like beyond my immediate favorites. The White Witch takes place during the English Civil War, between the Cavaliers (Wrong but Wromantic) and the Puritans (Right but Repulsive.) The book follows the Haslewood family through two threads. There is Robert Haslewood, who goes to war with Cromwell against the King, and risks losing all his most beloved family traditions in the new dispensation. Then there is the domestic side, in which Robert’s wife, children, and cousin Froniga (the white witch in question, the child and grandchild of gypsies — a very sympathetic portrait, incidentally) feel the effects of the war, and struggle to maintain some sort of order and balance between home life, God, nature, and the competing calls of country, church, and neighbor. The great themes of all Elizabeth Goudge’s books are certainly in evidence here. It would be easy to mistake her books for romances, but she never shies away from what is painful in relationships. She deals with the highs and lows of human experience, both intense joy and terrible suffering, certainty of the presence of love and the bleakness of its absence. She creates the notion of a life built from the outside in: the acceptance of restraints that may look like burdens, but which form a life that is eventually full of freedom and joy. (I might call this the sonnet principle: accept the form and you may say whatever you like within it.) She also considers the possibility of the substitution of one person’s pain for another, offering up suffering in love so that another person may live free of it. I’ve rarely seen a Goudge novel that’s free of bad or at least ill-assorted marriages, but these notions of love, duty, pain, and freedom make them into things of life in the end. For Goudge, this is all cast in the light of God’s meaning for his children, and she doesn’t take the pat, comfortable way out of these questions. What is flame, she asks, if it makes a true shape? Children are a constant presence in her books as part of a family, and they are capable of insight, love, and wisdom, but these are not cherubs. Goudge’s children lie and boister and shiver, just as adults do. This makes Goudge one of the few adult authors I know who treat children quite seriously as human beings. Goudge also does wonderful descriptions of nature: gardens and forests and herbs and animals. In some ways — and this is going to sound strange, I bet — she reminds me of Colette, if Colette had the slightest religious sense. There’s the same deep understanding of relationship and experience — especially women’s experience — and the same love of setting, particularly when it involves a home and a garden. You’d never mistake them for each other. But they seem reminiscent somehow. If you are allergic to any kind of sentiment, Elizabeth Goudge may not be for you. But this is not squishy, wishy-washy sentiment that ends with the right girl in the arms of the right boy and happy-ever-after. (Not that there isn’t a place for that! But it’s not here.) The White Witch is full of powerful feeling that belongs to an understanding of character, growth, and development, not just from child to adult but from one stage of adulthood to another: the relinquishment of power so that others can flourish; the cultivation of tenderness and loyalty; the understanding of suffering as, sometimes, a good to be endured. I didn’t think I had read anything by Elizabeth Goudge, but when I looked up a bibliography I saw she wrote I Saw Three Ships and Green Dolphin Street. I read the former when I was young and saw the movie of the latter back in the days when old movies were shown late at night on TV and I was supposed to be in bed, but sneaked downstairs instead. Which reminds me that it’s about time I read the novel upon which the movie is based. Might as well add The White Witch to the list as well. Thanks for reminding me about this overlooked author (at least formerly overlooked by me). I wrote a review of Green Dolphin Country (the British name of the book) on this blog about a year ago. I thought it was wonderful. If I were to recommend a place to start, though, I’d recommend her trilogy about the Eliot family: The Bird in the Tree, Pilgrim’s Inn, and The Heart of the Family. The third of those is very talky but still great, in my opinion. Thanks for recommending a place to start. One of these days, I’m going to read this author, and it will be all because of your influence. Oh, I hope you like them. Most books I can let go, but these are such favorites I’d be sorry if someone I liked didn’t enjoy them — like introducing two good friends, you know? Elizabeth Goudge was always one of my favorites. She was the first author I experienced who wrote from people’s heads – men, women, and children as people first – and I loved her themes of people dealing with lives totally different from what they expected and trying to maintain their daily integrity and kindness. My husband’s first gift to me after we married was a copy of the Dean’s Watch. I think the Eliot books are a great place to start, and I also loved The City of Bells and The Scent of Water. I love those themes, too. The Scent of Water is wonderful. I haven’t read The City of Bells yet — it is on my list — but everyone says it’s great! I plan to try to make my way through more of her list in the near future. It’s always lovely to find fellow fans of Elizabeth Goudge! I’d never even heard of this book and from your review it sounds terrific. ‘I’ve rarely seen a Goudge novel that’s free of bad or at least ill-assorted marriages, but these notions of love, duty, pain, and freedom make them into things of life in the end. For Goudge, this is all cast in the light of God’s meaning for his children, and she doesn’t take the pat, comfortable way out of these questions. What is flame, she asks, if it makes a true shape?’ – this is such a good point! I don’t know why Goudge isn’t more read. Perhaps because we’re not comfortable with ideas of duty and loyalty in our very fragmented society? But her work is very beautiful, and I’m always glad to find other fans!